Chiang Mai, Thailand is a sprawling city that was first established in the late 13th century. The historic Old City was once a walled city with gates and a moat for protection. Designed as a square, the layout features a grid of roads and numerous sois (alleys) connecting them. There are temples in Chiang Mai that are as old as the city itself. Today, preserved city gates and crumbling bricks are all that are left of the wall and the surrounding moat is more decorative than protective. The sois are lined with accommodations, massage parlors, shops selling tours, a plethora of cafes and numerous Thailand ancient temples. From almost anywhere in the Old City is is possible to spot the rooftop of at least one temple, but usually more. The Chiang Mai temples are of various sizes, ages and stages of survival – and there are three temples in Chiang Mai that should be on every Chiang Mai itinerary. 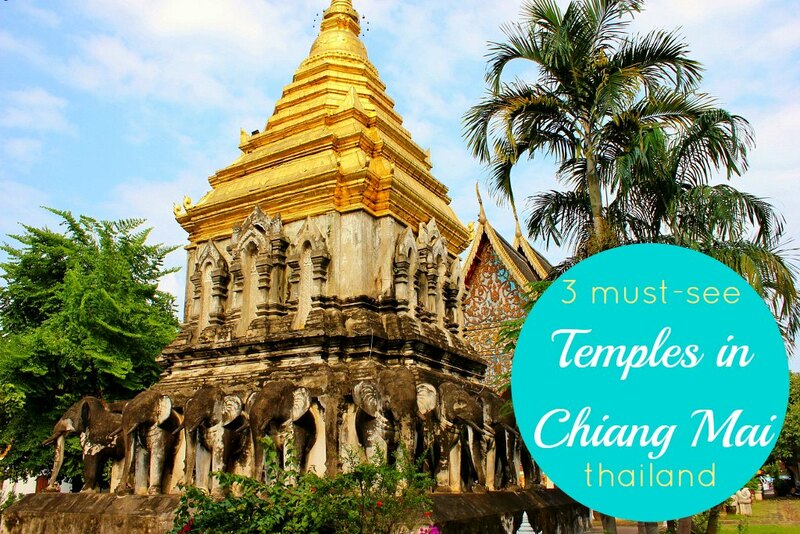 Of all the temples in Chiang Mai (which we’ve heard number more than 30), we think the best temples in Chiang Mai are: Wat Phra Singh, Wat Chiang Man and Wat Chadi Luang. 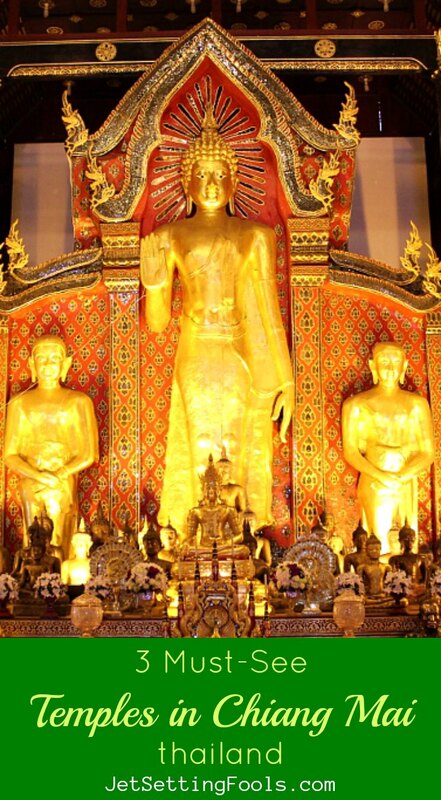 Probably the most famous temple in Chiang Mai is Wat Phra Singh. Wihan Lai Kham, the small building toward the back of the complex, is the most visited structure as it houses the Lion Buddha (Phra Singh, for which the temple is named) and historic wall murals that depict the daily life of the people of ancient Chiang Mai. The chapel is decorated in meticulous lai krahm – gold stenciling. We visited some of the other structures on the grounds, including one where motionless monks sat in deep meditation and another that was completely filled by a single, enormous Reclining Buddha. The oldest temple in Chiang Mai, Wat Chiang Man, dates to 1296, the same year the city was founded. But, what makes it one of the top temples to visit in Chiang Mai are the two Buddhas it houses – an 1800 year old crystal Buddha and a 2500 year old marble Buddha. 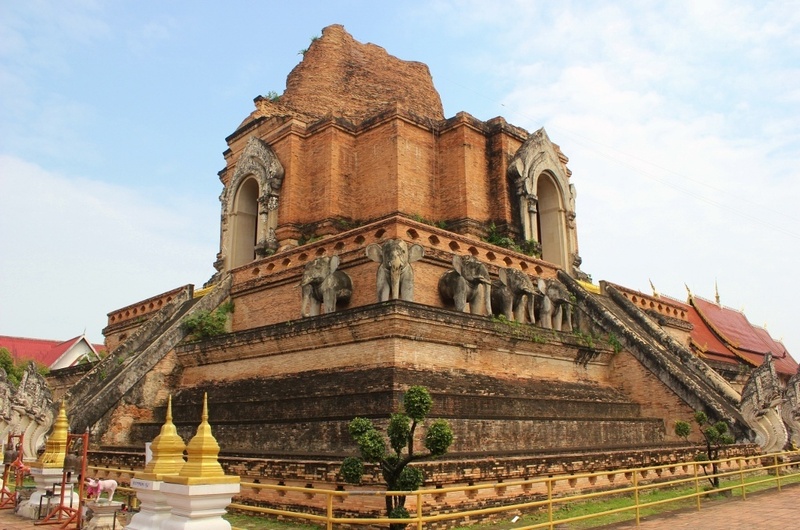 Also at the complex is the Sacred Elephant Encircled Stupa (or chedi), which was at one time the royal residence where the king lived while the temple and the city of Chiang Mai were being constructed. It is said that the stupa houses a Sacred Hair Relic from the Buddha. At the back of the complex is a quaint temple that sits on stilts in the middle of a small square pond, reachable only by a bridge that was retracted. It made us wonder if a monk was inside, left to meditate. Built in the early 1400s, Wat Chedi Luang reigned as one of the tallest buildings in Chiang Mai before collapsing during an earthquake in 1545 (and wasn’t reconstructed until the 1990s). Famous for housing the Phra Kaew (Emerald Buddha), a jade replica now resides in the east-facing nook, while the original Emerald Buddha can be found in a temple at the Royal Palace in Bangkok. We struggled a little to understand Buddhism; we noticed many similarities and differences at the temples in Chiang Mai. Some of our questions were answered at the temple at Wat Chedi Luang. There was information regarding the different Buddha positions and corresponding meanings, which are more significant than we first thought. We also learned about the bowls labeled with the days of the week. Initially we thought donations were to be placed in the bowl of the day we visited the temple, but, in fact, we are supposed to put our donation into the jar of the day of our birth for good fate. Our education of Buddhism and the temples in Chiang Mai increased exponentially when we joined a conversation with Chiang Mai monks during Monk Chat. 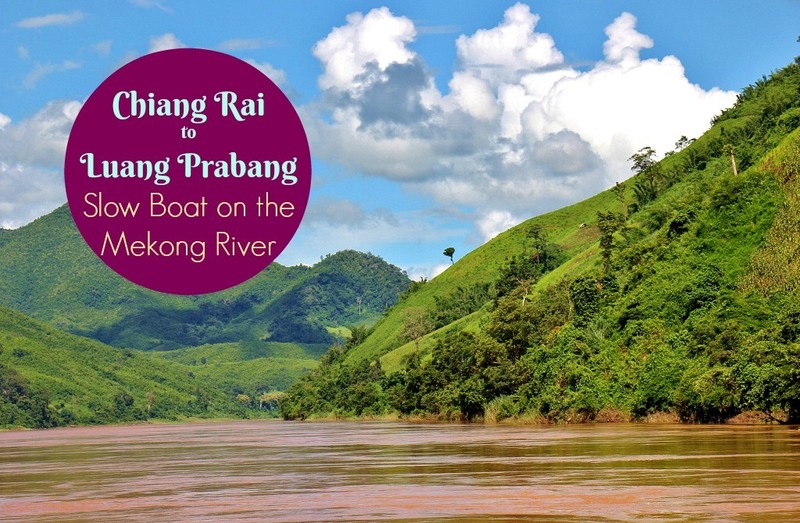 – something we highly recommend while visiting the temples in Chiang Mai! You can ask questions about Buddhism, life as a monk or simply inquire about Chiang Mai life in general. Click here for a Google Maps walking route to the top temples in Chiang Mai. You can also use this map to create your own Chiang Mai Old City Walking Tour. Touring the temples of Chiang Mai with a guide can help visitors to better understand the significance of the temples – and Buddhism, in general. 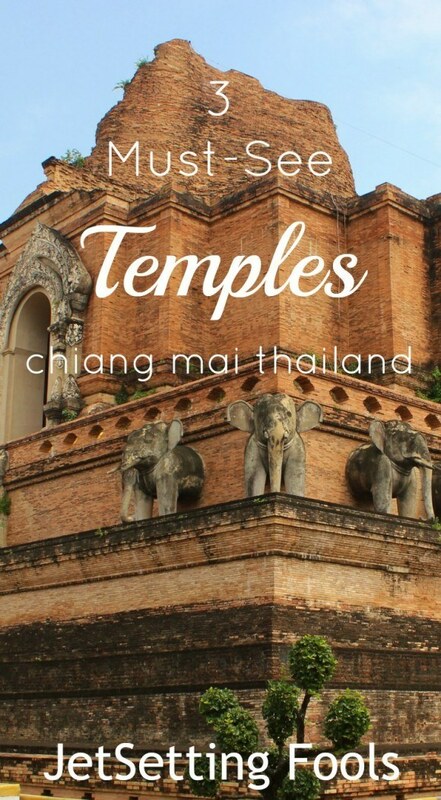 There are several tours that explore the temples in Chiang Mai Old City – as well as temples outside the city walls. Among the most popular (and highly-rated) Chiang Mai Temple Tours are a half-day temple tour and a morning almsgiving temple tour. 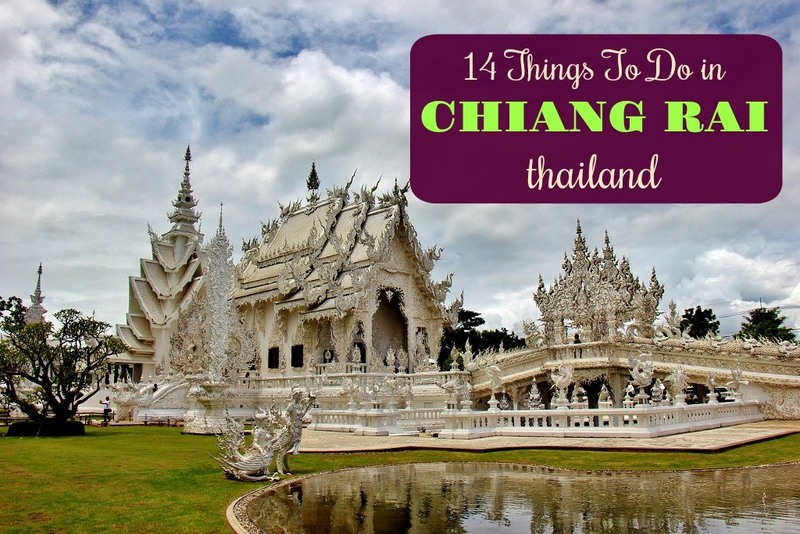 Additionally, there are day trips to Chiang Rai – as it is possible to visit Chiang Rai’s famous White Temple from Chiang Mai in a single day. Search for other Chiang Mai City tours here. 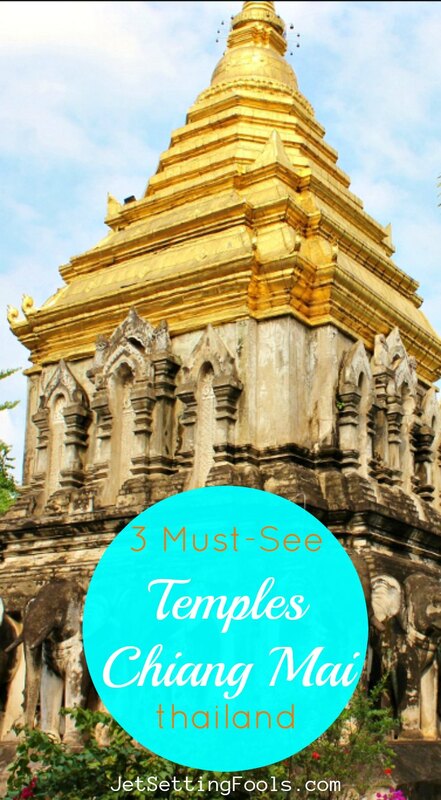 Looking for other temples around Chiang Mai? Read about visiting two popular temples outside of Chiang Mai Old City: Doi Suthep and Doi Kham. Doi Suthep is one of the well-known Chiang Mai, Thailand temples that is situated in the hills overlooking the city. The big Buddha in Chiang Mai (55-feet-tall) can be found at Doi Kham. 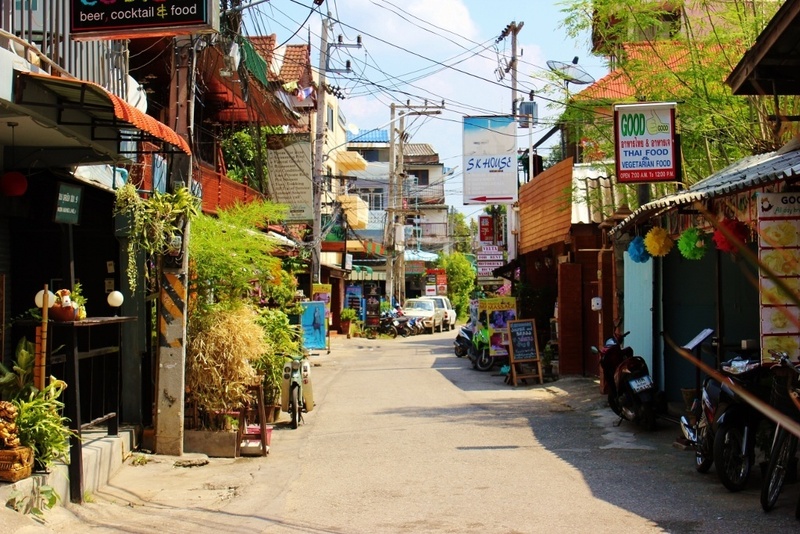 During our visit to Chiang Mai, we stayed in the Anoma 2 Bed and Breakfast in the Old City. However, there are many Chiang Mai hotels to choose from in – or close to – the city center. Hotel deals can be found by bidding on Priceline. Budget travelers can search for Chiang Mai Hostels. For a true bargain – and a unique experience – search for hosts on Couchsurfing, where travelers stay with locals for free. Chiang Mai can be reached by plane, bus or car. Our preferred method of getting anywhere is by flying (we are JetSetting Fools, after all!) and when we do need to purchase plane tickets, we start our search for the best deals on airline tickets on Skyscanner or Flight Hub. We aren’t keen on driving abroad, but renting a car can often save time and money (especially when traveling with more than two people) – and it allows for greater discovery. Chiang Mai is a walkable city…but only if you have the right shoes! Don’t forget to pack a pair of lightweight and comfortable walking shoes for your trip. I (Sarah) have traveled with these shoes by Columbia, Skechers and Reef. Kris prefers wearing these shoes by Merrell and Sanuk. It’s easy to get turned around in any foreign city. Make sure to have a good city map and/or guidebook before arriving. 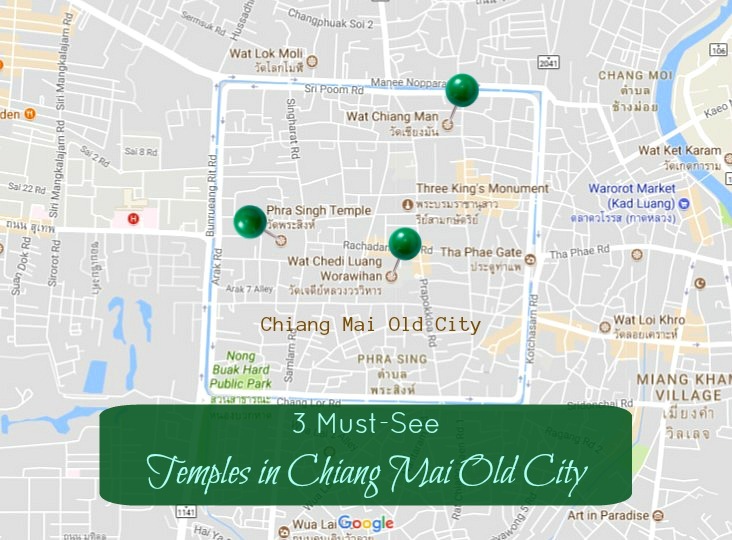 We want to know: Are there other Chiang Mai Old City temples that you would add to our list of the 3 must-see temples in Chiang Mai? Tell us in the comments! This entry was posted in RTW Travel, Thailand, Travel and tagged buddha, buddhism, buddhist, budget travel, chiang mai, itinerary, jetsetting fools, old city, pagoda, photos, RTW, temples, thailand, things to do, travel, walled city, wat, what to do, what to see. Bookmark the permalink. Have been to Wat Chedi Luang, the Monk Chat was definitely something not to be missed. I’m a Christian, so it was fascinating to get the monks’ outlook on life and the hereafter. I was both impressed by some things and not so impressed by others (one we talked to had absolutely no interest in Buddhism at all, he was just in it for the educational opportunities). Have also been to the White Wat which I found to be very unsettling and creepy. Conversation piece though! These three are def pretty, but i loved the silver one too, Wat Sri Suphan! I’m not sure we made it to that one, Stephanie. Thanks for the tip! !